Roof Pitch is a term describing how steep or flat your roof slope is. The combination of two numbers are used to display or show the roof pitch. 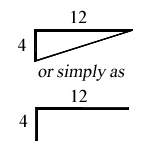 Two most common methods (4/12 or 4:12) are used for marking the pitch of a roof. On blue prints architects & engineers usually display the pitch of a roof in the format shown on the image where number (4) represents a rise and number (12) represents a length. This means if a roof rises 4' in the length of 12', your Roof Pitch would be 4/12 or 18.43 degrees.